Hexagon Metrology announces today the launch of Leitz SIRIO Xi, the new standard for the shop floor. Its designers concentrated on six key customer requirements: maximum throughput, maximum precision, maximum efficiency, maximum speed, maximum competence and a forward-looking technological configuration as part of Germany’s “Industry 4.0” concept. The result is convincing in every respect: the Leitz SIRIO Xi features impressively high availability and low life cycle cost while continuing the Leitz hallmark of high measuring precision. Leitz SIRIO Xi benefits from an extremely robust design and can be quickly and easily set up or moved. Equipped with a stylus changer (with up to 24 magazine positions) and a new control unit, the SIRIO Xi enables excellent flexibility and reproducibility, providing ideal support for networked manufacturing processes and serial production process control. With its proprietary rotary table, Hexagon Metrology has once again raised the bar in application and operation technology, too. Hexagon Metrology has consistently implemented the principle of “dynamic mass is light, static mass is heavy”. The high static overall mass with low center of gravity gives the measuring machine stability as well as resistance to forces and vibrations. Because local temperature fluctuations are the enemy of metrology, we use high-quality materials in the development of the Leitz SIRIO Xi. The machine offers excellent thermal conductivity combined with high stiffness. Thermal compensation minimizes temperature gradients throughout the whole machine; every single day and allows measurements in a temperature range of up to 40 °C. 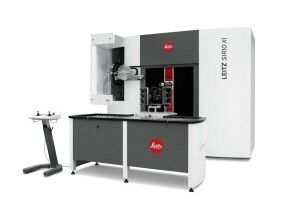 The Leitz SIRIO Xi is immediately available in the EMEA region from Hexagon Metrology’s commercial operations.